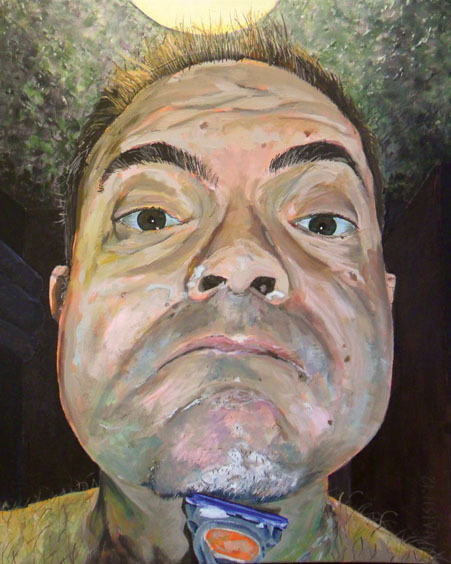 I have been intending a self-portrait for use on the “about-me” pages of the web site. The grand idea was to firstly paint a conventional portrait on a canvas of proportions divisible into squares. I would then photo the canvas, divide the image up into squares then re-arrange these to create a “confused” look (something like a Chinese puzzle) then repaint this image. I would use both paintings on the web site, where one would morph into the other on cursor roll-over. I felt that the face should fill the page (somewhat like this piece), which I hoped would make the later abstraction work better. I earmarked a pair of large canvases that matched but their size made me feel I aught to start with a smaller “Practice” version. It was around this time, that I had the idea for the shaving painting. The “How I see myself” seemed a clever ruse. I liked that the pose would be real and not “made up”. I was feeling remarkably clever at this point until a week later when visiting the private view of the 2012 Hertford Open. Here was a painting of this exact same idea. Not put off, I proceeded blocking in the picture. My wife was not keen, and on its fairly rapid completion, I took it to my mother for dissemination. She was even more negative, which saddened me as I genuinely felt it was one of my better pieces. I like the study of shapes and don’t feel it needs to capture my essence. I didn’t feel that these reactions were completely un-useful, as the piece successfully generates an emotional response. Indeed, I played on this offensive aspect by titling the piece “I shave in your general direction” as though the “visual swearing” is intentional. Other aspects of the painting I like include the weird ceiling (actually white artex) and the claustrophobic/ distorted feel of the bathroom provided by the open door and the towels on the rack.